A tamarisk eradication spray program begun almost ten years ago along a portion of the Arkansas River has transitioned into a restoration project this year by the Colorado Division of Natural Resources and Parks and Wildlife. Travis Black, Colorado Parks and Wildlife area manager, said a restoration program has begun which will re-seed the areas between Granada and the Kansas State Line. “The area will be re-vegetated with natural grass species along with willow shrubs and we’re planting cottonwood poles as well,” he explained, adding that the eradication program took some hops and skips between the towns along the river to the Kansas border. Tamarisk, similar to Russian Thistle, is an invasive plant introduced into southeast Colorado decades ago. Unfortunately, it consumes hundreds of gallons of water per plant and is very hard to kill. Its growth along the Arkansas River allowed it to spread, siphoning off thousands of gallons of water and added to the salinity of the river. Another drawback was in flood mitigation as the plant, growing along the banks of the river, restricted the water flow along the channel which created backups and flooding. The trick to effectively killing off tamarisk is patience. Even after a comprehensive spraying program, it takes a minimum of three years to be sure the limbs, seed and especially roots are dead. A collaboration of a number of groups including the NRCS and Prowers County sought grant funding to finance the aerial spraying of approximately 400 acres to begin with in 2009, but because of increased funding and a lower cost of service, the area was increased to 1,500 acres. Contributing groups included the Colorado Water Conservation Board, Colorado State Land Board, Holly Flood District, Tri-State G & T and the Northeast Prowers Conservation District among others and some private landowners. Black said, some of the spraying was more effective than anticipated as a lot of the undergrowth was killed off along with the tamarisk and that eliminated the cover for local wildlife species. The revegetation program will help restore the riparian areas to their natural state and habitat. Not all of the funding is complete for the entire stretch of river into Kansas, but the acreage has been cleared along the Arkansas River, especially visible as you cross the bridge along Highway 50 just a few miles west of Holly. He said there’s no end date to the restoration program, but it will continue when new funding streams become available. The dead tamarisk plants were excavated and ground up on the spot, using specialized equipment that is loaned out to projects around the state. 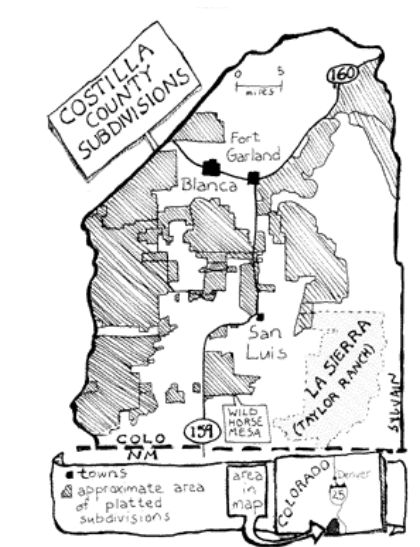 Sangre de Cristo Land Grant, La Sierra Common, and Subdivisions. La Sierra is the 80,000-acre common land or ejido. 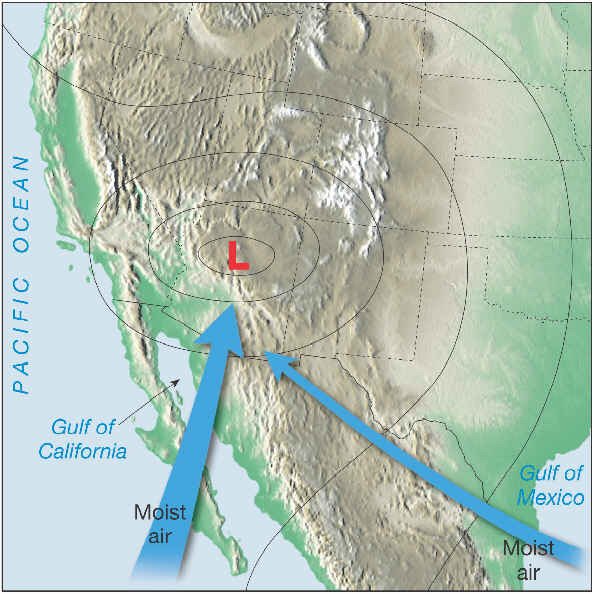 Map courtesy of High Country News at URL: https://www.hcn.org/issues/104/3250. For many people, spring is a time for deep cleaning, a time to take stock of and prepare for the year ahead. That’s also the case on farms in southern Colorado and northern New Mexico, where farmers spend their weekends banding together to clean out the irrigation ditches that bring snowmelt to their fields. The clean up, known as the limpieza, is part of an irrigation tradition unique to this region for centuries. If not for the clean up, water would pool in places it’s not needed, caught up in makeshift dams of trash and vegetation. Small farm towns in portions of the San Luis Valley, like San Pablo, are organized around acequias, networks of irrigation ditches and canals dug nearly 150 years ago. It’s what makes farming possible in this dry stretch of land. While most Western law views water as property – a commodity people own and trade – acequias see it as a community asset, something tied to the land and shared. Quintana, 61, grew up on a farm in San Pablo. As an adult, he left for a career in IT, always knowing his family’s land would be here for him to return to. He participates in the annual ditch cleaning now because he always has. But Quintana says there’s a growing sense that it will be difficult to bring the next generation back to the valley to keep the acequias functional and vibrant. On this day, the limpieza moves fast. The ditch is cleaned, and a group of middle-aged farmers pile into the back of an old pickup truck to head to the volunteer fire station for chicken fajitas. It’s hard to overstate how radical the idea of sharing water in the West is. Everyone outside an acequia in states like Colorado, Utah, Arizona and Nevada, uses the prior appropriation system for water. That system, where your right to water is given to you based on when you claimed it, doesn’t allow for easy sharing, but it’s the core tenant of acequia management. Distribution of water is based on equity and need, not given out because you claimed it first. Sharing water sounds easy if snowpack is high and runoff is plentiful. But in times of scarcity everyone within an acequia feels the shortage together. Acequias vary in their style of governance. A common form is as a civic association, with members, the people who irrigate with water from a particular ditch, a board of directors and at least one employee who runs the ditch. That person is the mayordomo. Augustin “Roy” Esquibel is the mayordomo for the ditch cleaned today. When he arrives at the fire station for lunch, he takes the time to shake everyone’s hand, and jokes that he’ll have to walk a lot more ditches to work off these fajitas. He motions down the street, toward the church of San Isidro, the Catholic saint of farmers. This valley is sustained by agriculture, he says. Everyone here is either currently farming or a descendent of farmers. 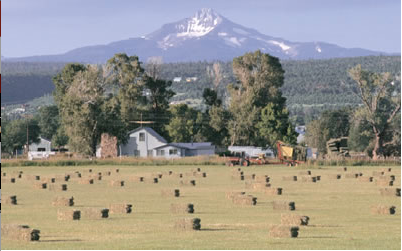 The land today is used to mostly grow hay or other grasses for cattle and horses, with some wheat and dry beans grown as well. As a water steward, Esquibel says his faith guides his decisions. Experts say that for farming and gardening, raw water is ideal. Raw water attracts pollinators, like bees and butterflies, and plants and flowers flourish quite well with the microbes and other naturally occurring particles present in it. It’s taken a community of people and organizations coming together to make Norwood’s raw water system possible. From the beginning, officials in the Norwood Water Commission and the Public Works Department had wondered if the town could make the project plausible. Lippert said the town explored the idea some 20 years ago, but citizens weren’t ready for it then. He said that in the last few years, officials began to revisit the idea and wondered if the town’s existing water shares could be put to use as a raw water utility service for residents. The town does own 119 shares of Gurley water (managed by Farmer’s Water Development). In 2015, town officials reopened the conversation with members of the Norwood Water Commission, Farmers Water and other regional water groups. Along the way, the Norwood Lawn and Garden Group, spearheaded by Clay Wadman, who owns a home in Norwood and who wanted to see the project succeed, worked on education and outreach in town. The garden group worked to help the town sell residential raw water taps and supported Norwood in the fundraising process. Soon, grants began rolling in from the Southwest Water Conservation District ($175,000), San Miguel Water Conservancy ($5,000), the Telluride Foundation ($5,000) and San Miguel County ($25,000). In 2017, the Department of Local Affairs made a decision to give Norwood’s project around $690,000 in a matching grant to make raw water in Norwood a reality. The Town of Norwood also put money in — around $68,000 for final engineering — from the town’s reserves to move the project along. In 2017, town officials also budgeted $25,000 for the project; they’ve earmarked another $200,000 from the capital improvement fund if those funds are needed. Norwood’s Town Administrator Patti Grafmyer said seeing the raw water system come to fruition is quite an accomplishment for the town. While it’s true that utilizing raw water makes flower and vegetable gardening possible, officials say it offers additional benefits, such as helping to increase property values. The Kurtex Management Company, which owns Norwood’s Cottonwood Creek Estates, purchased 31 residential taps for raw water. Wadman has said the system there will no doubt transform the look of the neighborhood: rocky areas that comprise the lots can be replaced with landscaping, and raw water at each residence will sustain the lawns. At the same time, Cottonwood Creek Estates’ residents will have the option of gardening and producing their own food. 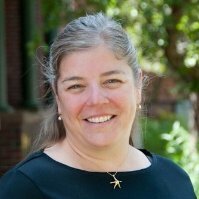 Amy Beatie, Executive Director of the Colorado Water Trust since 2007, announces her endorsement by statewide and local leaders in the Democratic primary for State Representative in Denver’s House District 4. The endorsements come from Ruth Wright, second woman ever in Colorado to become the House Minority Leader, a role that she held from 1986-1992; Gail Schwartz, former State Senator from Crested Butte; and Jeni JAMES Arndt, current State Representative from Fort Collins. 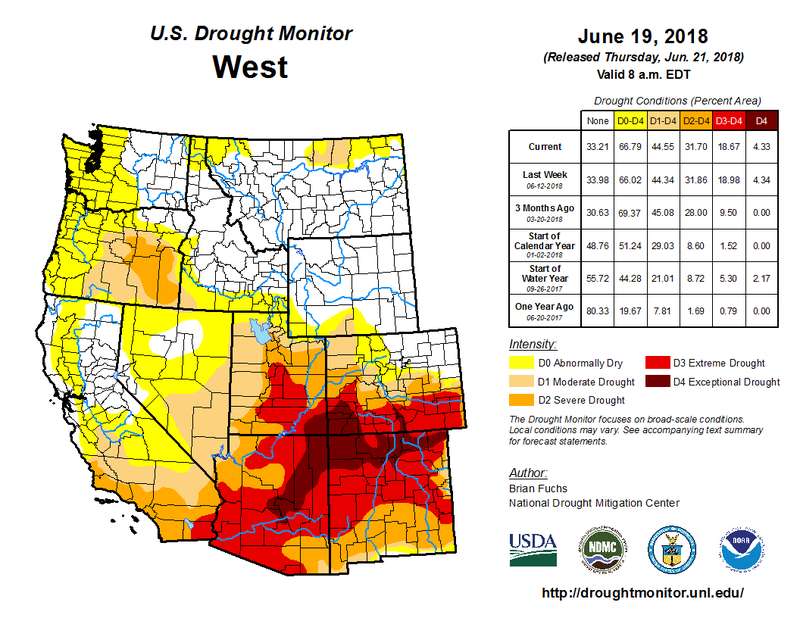 West Drought Monitor June 19, 2018. Low snowpack and a dry spring have pushed most of Colorado into a record-breaking drought. The conventional calculation of Colorado River shortage risk, which people like me frequently report, shows a 51 percent chance of Lake Mead dropping into “shortage”, below the magic trip line of elevation 1,075 at which mandatory cutbacks kick in, in 2020. But a new approach to modeling risk, which lots of folks (*cough* me *cough*) think more accurately represents the changing climate, shows a significant risk of a much quicker drop in Lake Mead’s levels, blowing quickly past 1,075, with a greater than 50 percent chance of dropping below 1,050 sometime in 2020. Absent actions to reduce water use, Lake Powell has a greater than one in four chance of dropping near power pool (the level at which it could no longer generate electricity) by the mid-2020s. It is to the Bureau of Reclamation’s credit that they’re not only running the new modeling methodology in parallel with the more traditional approach, but that they’re doing this in a very public way, presenting both last week at the Basin States principals meeting in Santa Fe as part of the federal effort to get negotiations over water use cutbacks back on track. I like this graph (kudos to Carly Jerla and the other wizards at the Bureau for coming up with such a clear visualization) because of how intuitively it shows how different the answers are when you use the two different approaches. Especially visually striking is the probability “cloud” showing the statistical range of possibilities. The old blue approach shows a decent chance of wetness refilling reservoirs. 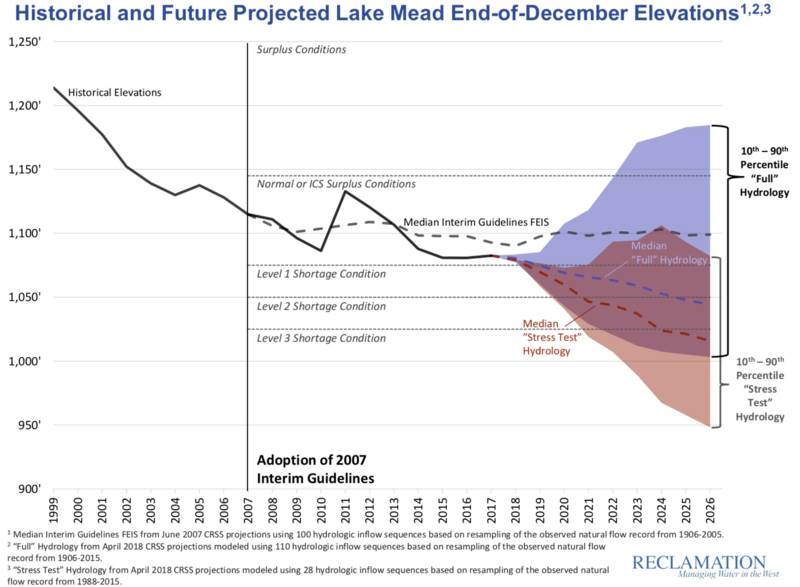 The newer red approach not only offers no such blue bits of optimism, but shows some statistically credible chances of Lake Mead seriously tanking very soon. The difference between the two modeling approaches gets to the heart of the importance of the “period of record” you use to analyze river flows in support of decision-making. The traditional (blue) approach uses historic river flows from 1906 to 2015 as the basis for a statistical simulation of the range of possible futures given current reservoir levels. This is classic “stationarity” – assume the future will be like the past. The specific model then uses what’s called the “index-sequential method” (ISM), which is a bog standard way of modeling the statistics of river flows. The new approach (red), which has come to be known as the “stress test”, is based on the view of some water managers and scientists that the old full-record approach is understating risk, because the past climate – especially in the case of the Colorado River that exceptionally wet first quarter century of the record – is putting more water in the river in your simulations than we can realistically expect any more because of a warming climate. The stress test still uses the ISM, but instead of the full record, it uses 1988-2015, which seems more like a modern climate than the full thing back to 1906. The House of Representatives passed a Farm Bill last week by just two votes. While many objected to its work requirements for recipients of food assistance, others were critical for its effects on the environment. According to the Natural Resources Defense Council, the bill repeals clean water safeguards and exempts companies that spray pesticides into waterways. It also exempts chemical makers from enforcement when pesticides harm or kill endangered species including some bees, and it prohibits local communities from adopting their own pesticide laws, if they are more strict than federal standards. Further, the House bill would exempt public lands from wildlife and water conservation safeguards. And EcoWatch reports that it would allow mining and logging in Alaskan forests. 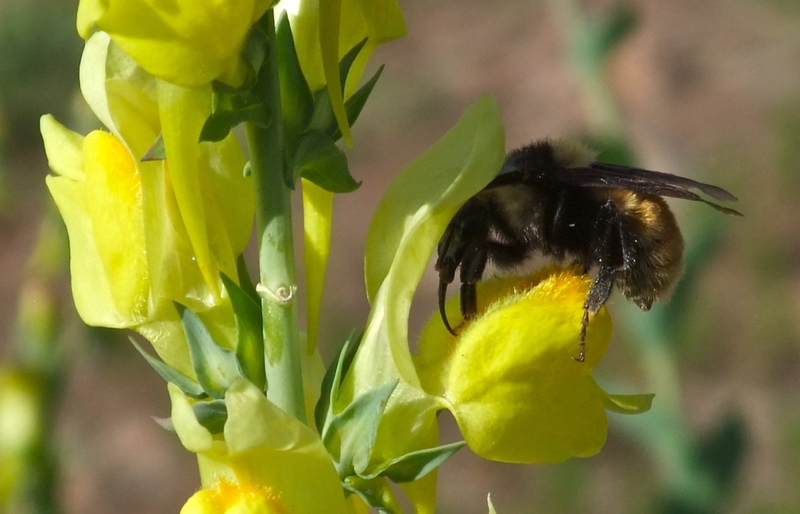 A spokesperson for the Center for Biological Diversity said in a release that the act is a “stunning gift” to the pesticide industry with staggeringly harmful implications for wildlife. The House bill now goes to the Senate, which may vote on it next week.